So just what happened to Captain Britain’s eye in Avengers Time Runs Out? | The Captain Britain fans' page and blog. So just what happened to Captain Britain’s eye in Avengers Time Runs Out? As New Avengers issue 30 draws ever closer speculation is starting to mount over just what happened to Captain Britain’ eye. So today I’m going to look back at the Time Runs Out story and clues so far and see if eye – groan – can figure out just what happened to Cap. 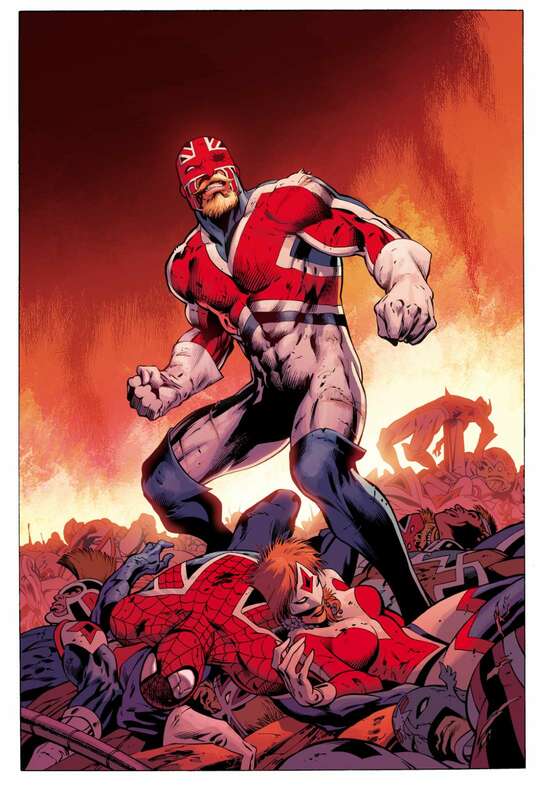 The first clue lies in when we see Captain Britain’s debut in New Avengers 25 looking like this. Now is he referring to the Illuminati’s current base or what’s behind his eyepatch? Another clue was given away in Avengers 37 when Captain America discusses blackmailing Captain Britain and brings up his SHIELD file. Why don’t SHIELD know about Cap’s missing eye? I believe it’s because the circumstances of its loss are secret and whoever did it didn’t want Captain America to know, almost as if it’s something the Illuminati want kept under wraps to help them if their situation gets desperate. The cover to the forthcoming New Avengers 30 gives us another clue. Now notice Cap is already bearded suggesting he’s be on the run some time, but his eye is damaged with no patch. So did he lose it in an other worldly battle with the Captain Britain Corps, or is it a weapon that has just been unleashed, hence the reason why so many dead heroes surround Cap? In a previous post’s comments Ads drew a comaprison between Norse god Odin and Captain Britain, now Odin sacrificed one of his eyes for wisdom if I remember my mythology correctly; so has Captain Britain done the same and allowed Reed Richards to implant a super weapon in his head? Avengers writer Jonathan Hickman has never been a person for going for an easy answer, so only time will tell if I’m right or not and bearing in mind my Spider-UK predictions were totally wrong my thoughts here could be rubbish as well! 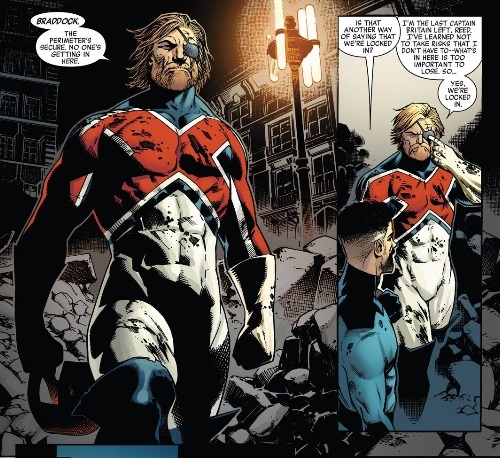 What do you think happened to Captain Britain’s eye, sound off in the comments below. 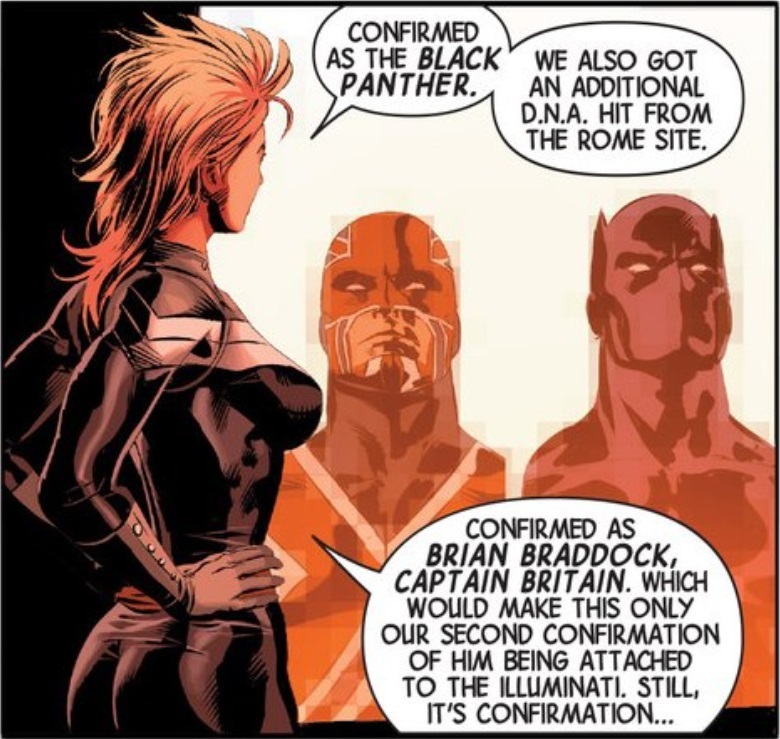 This entry was posted in Crossovers, Opinion and tagged Avengers time runs out, Captain Britain, Illuminati, Jonathan Hickman, missing eye, time runs out by Richard. Bookmark the permalink. I’m hoping for something different along those lines not that he just got it poked out in a fight !